Hundreds of thousands were at the Kotel (Western Wall) on Monday morning for the Birkat Hakohanim Priestly Blessing ceremony, as hundreds of Kohanim priestly descendants blessed the nation in time for Pesach (Passover). Arutz Sheva got the chance to speak with Israel's chief rabbis about the blessings, and their own blessings for the Jewish people. Ashkenazic Chief Rabbi David Lau said "it's a great merit for all of the people of Israel who stand here in a place that is so sanctified and so unique, standing and meriting the blessing of Heaven, everyone - with no difference in ethnic communities." The mass of Jews gathering for a blessing were there "in a prayer that next year we will all merit to stand and be blessed from the mouth of the Creator of the Universe through His delegates the Kohanim, those serving G-d at the holy and pure place up above at the top of the (Temple) Mount," added Rabbi Lau. The reference to ascending the Temple Mount, where the priestly service at the Temple occurred and is to occur at the time of the final redemption, comes at a time when the Jordanian Waqf still enjoys de facto control of the site and has forbidden Jewish prayer. "I bless the people of Israel with the blessing of a kosher and joyous Pesach," Sephardic Chief Rabbi Yitzhak Yosef added. "Happy holiday, may they merit many good long years." 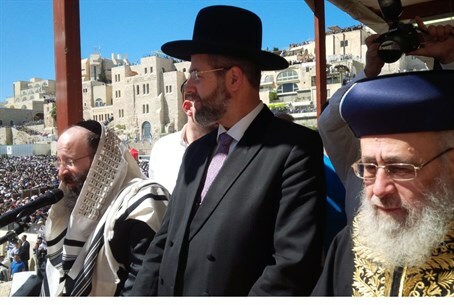 Chief Rabbi of the Kotel, Rabbi Shmuel Rabinowitz, also spoke with Arutz Sheva, saying that the priestly blessing is "a great and enormous blessing." "The Holy One Blessed be He guarantees it," said the rabbi, quoting the scriptural reference behind the priestly blessing in which it is written "place my Name upon the children of Israel and I will bless them." "There is no greater blessing than this," stated Rabbi Rabinowitz. He concluded saying, "with G-d's help may this blessing be upon all those who were here, and all those who joined us and heard it, and all of the house of Israel. May we receive all of the blessings written in the Torah, amen." The messages from the rabbis, in Hebrew, can be seen below.